Scroll Down the Screen to See Turnberry Place Condos for Sale MLS Listings. 2019 promises to be a Banner Year for Turnberry Place condo owners. The Stirling Club is reopening. It was the heartbeat of the guard gated towers, located in the center of Turnberry Place. Membership sign ups are now underway. For a limited time, the initiation fee is being waived for the first 300 people who join. Turnberry Place’s Stirling Club is open to Turnberry Place residents at the lowest tier of pricing. Non residents can also join, as can out of town owners on a 45 day per year limited basis. Read all about The Stirling Club HERE. Turnberry Place is comprised of 4 Towers, each 37 stories high. Floors 28 and up are considered penthouses, as these condos have higher ceilings. 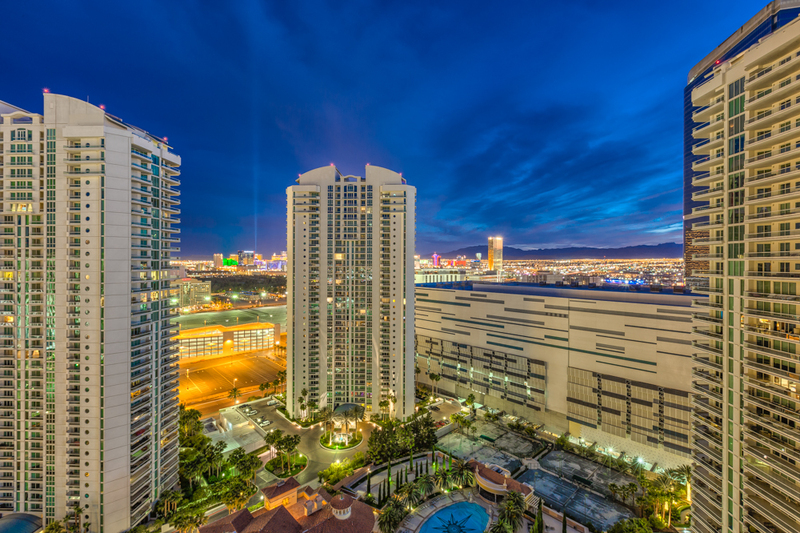 The top level Penthouses at Turnberry Place are unlike any others in Las Vegas. These multi-level condos are truly the Epitome of Posh. Why? They each have a private swimming pool and elevated spa with glass surround. All this and an outdoor fireplace as well as multiple sweeping terraces. These outdoor living areas offer absolutely amazing views of the Las Vegas Strip and surrounding Mountain Ranges. Turnberry Place is located on Paradise Road, a short drive to McCarran International Airport. HOA dues include limo service, cable TV and web access, valet, concierge, pool, gym, water, were, trash, and beautiful, secure, guard gated grounds. Originally, all condos at Turnberry Place were sold by the developer as “grey shell” and were customized by each owner. Units that are 2800 square feet or larger have private vestibules with direct elevator access. Smaller units share a vestibule with only one other condo owner. Each Tower has its own swimming pool. The complex also has tennis courts. Now that the Stirling Club is opening, Turnberry Place owners who join, will be able to have food delivery service. Back in the day, the Sunday Bruch was a treat. We had many a business lunch there. There is an indoor swimming pool, a large outdoor pool, nightclub, spa, gym, dining rooms that could be reserved, cigar room. We look forward to seeing the renovation this Spring. Buyers interested in Turnberry Place may also want to consider the luxury condos at Turnberry Towers, its sister property across Paradise Road.